On 21 August 2009, West Atlas oil rig owned and operated by Thai company PTTEP Australasia drilling in the Montara oil field offshore 200km from Broome, a West Australian town famous for its pearling and tourist industry, suffered a failure. A blogger from another site wrote an article on 21 October detailing continuing failed attempts to stem the flow of oil from a rig in pristine marine area of the North West Coast of Australia. After trying multiple times to plug this leak, the platform has, as of yesterday morning caught fire with the leaking hydrocarbons now fueling the inferno. No people were harmed when the rig caught alight. Environmental groups say the oil leak spilling into the Timor Sea should be declared a national emergency, with one expert likening it to a ''disaster movie''. TWO hundred kilometres off Australia's northwest coast, chunks of toxic residue, fallout from the nation's third largest oil spill, stain the normally clear water that is home to thousands of marine species and birdlife. The spill is reportedly Australia's worst since offshore drilling began more than 40 years ago. “If slicks the size of the Timor Sea spill occurred off Melbourne or Sydney there would be outrage,” said ACF Healthy Oceans Campaigner Chris Smyth. Interview with WWF on September 17 regarding the 15,000km slick over one month ago and its impact on marine life. In an effort to address environmental concerns, on October 15, the Australian government announced an agreement with the company responsible for the spill that marine monitoring of the, by then more than 15,000km2 spill, for two years. The study, funded for at least two years by Thailand’s only publicly-traded oil explorer, will provide information to address “the longer term environmental impacts of this disaster,” Environment Minister Peter Garrett said today. Economically prior to the leak the endeavors to drill and plug the bore hole had cost the company over $170 Million dollars. The company responsible for a massive oil and gas spill off the north-west coast of Australia has estimated the cost of the leak at more than $170 million - so far. Just two days ago a very experienced oil well firefighter claimed that this spill would take a further 2 weeks to be bought under control. VETERAN oil well firefighter Mike Allcorn, who tackled the Kuwaiti wells set alight by Saddam Hussein's troops in 1991, says the delays to plug the West Atlas spill have been frustrating. And he estimates it could be a further two weeks before his team can stop the oil spill in the Timor Sea -- now estimated to have cost the operators $170 million. Although it appears now that the fix may come sooner. It will be at least another day before experts will know if their next attempt to stop an oil leak and fire at a rig in the Timor Sea is successful. Jose Martins from PTTEP Australasia says experts are mixing heavy mud that will be pumped into the well below the rig, to stop the leak. "We require to mix 4,000 barrels of heavy mud and we need that level of mud and we don't have it at the moment, so that will be later on tonight," he said. Fortunately the rig is insured for $200 Million. 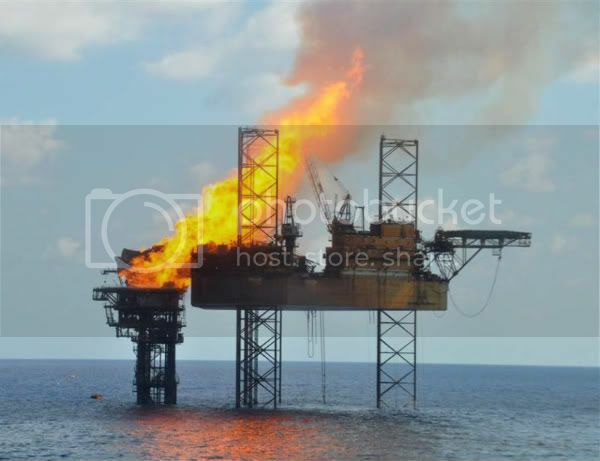 Seadrill spokeswoman Hilde Waalen said that the West Atlas, which is fully insured for $200 million, may be a “total wreck”, but added that an accurate assessment of the damage can only be made once the wellhead fire is doused. Additional leaks from other rigs operating in the area have also been reported, although reports are they are minor. It has been revealed that gas has been leaking from the Puffin oil field for about seven weeks. The Australian Federal Opposition has slammed the seven-week delay in the news of a gas leak at the Puffin field, in the Timor Sea, being made public, calling on Canberra to release all available information immediately. The Kimberley Coast line is one of the last pristine wilderness frontiers of Australia. But it is the fishermen of Indonesia who it appears will be severely affected almost immediately. A HUGE oil spill off northwest Australia has hit Indonesia, killing fish and destroying livelihoods in poor villages along the Timor Sea, a non-governmental group says. JAKARTA, Indonesia - Thousands of dead fish and clumps of oil have been found drifting near Indonesia's coastline more than two months after an underwater well began leaking in the Timor Sea, officials and fishermen said. Australias opposition party appear to be using this as a political football, however it was their administration, not the current one, which awarded this particular lease to this company. PTTEP, which operates oil and gas projects in 13 countries and has a market capitalisation of $US13.4bn ($15.65bn), was given approval by the Howard government to drill at the Montara oilfield in 2003. Although newer leases have been awarded this company by the Australian government after the leak started. The company responsible for an oil spill off the West Australian coast has acquired access to more Australian oilfields. PTTEP Australasia has so far been unable to plug the leaking Montara rig in the Timor Sea despite numerous attempts over nine weeks. PTTEP has also recently purchased additional stakes in the Timor Sea for further exploration and exploitation. For more information, Wikipedia have a very detailed page up on this. of issues involved in this mess. On the plus side (trying hard to be optimistic here), if the fire is burning off most of the leaking hydrocarbons, then the area of ocean impacted by oil slicks and dispersants should greatly diminish. I realize the trade-off is of toxic petroleum combustion products vs. ocean-going petro gunk, but, well, you know that's the best of what we can get, trade-offs. From the Skytruth blog, entry today. If you've not seen 'em, TXSharon posted videos of the plumes that blow off of gas drilling digs that provide worthwhile insight to those sorts of trade-offs, in the unburned form. Will try to repost the links here. Thanks to TXSharon's work there. It's obviously of a different 'nature' as to what's released from deep-sea oil drilling but not that different. How vilified Jimmy Carter was for having the audacity to suggest Americans turn down their thermostats and wear sweaters. Well, here we are. The planet is burning around our ears - and for what? Stuff. I just posted a damning NPR report about the affects of drilling on our health.